This performance was by Li Yang, a member of the National Peking Opera Troupe. Peking Opera is also known as Beijing Opera and is a regional style of traditional Chinese opera. It is said that one good second of Peking Opera requires 10 years of training. This was true of Li Yang who left his home at seven years old to train in an opera school. Since then his whole life has been dedicated to practicing and performing Beijing Opera. 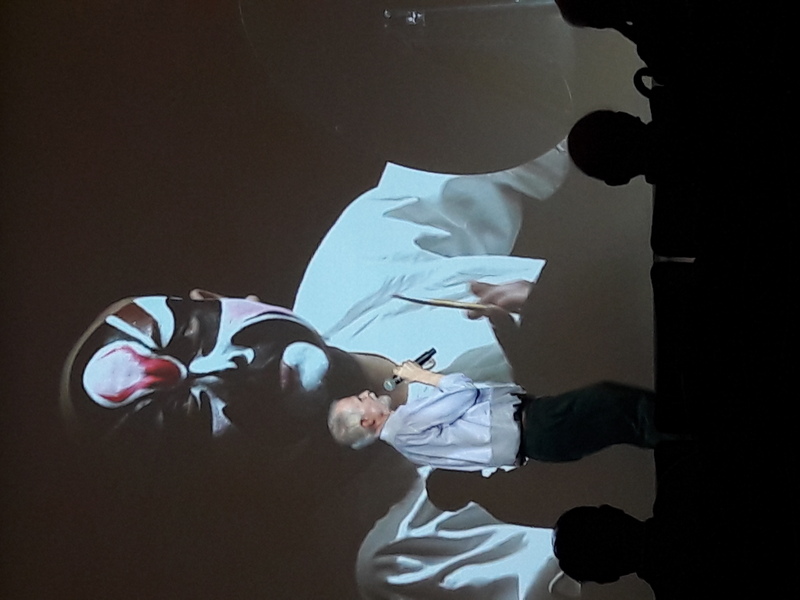 Before the performance began, we heard a history and background of Chinese opera, with an emphasis on Beijing Opera, which was given by Professor David Rolston. It’s a very interesting subject and I encourage you to do some research before watching a Chinese Opera. At least to learn about the main characters that will be performing and a summary of the plot. 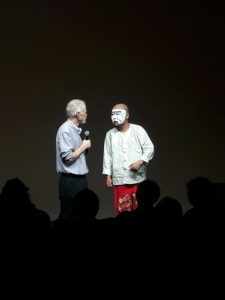 The face painting is important in Chinese opera because it can be very difficult to understand what is being said, even for native Chinese speakers. So the face paint tells a lot about the character. The color of the face paint is very important: red indicates loyalty, black indicates integrity, purple and pink indicate honesty, white indicates conceit and trickery, yellow indicates an aggressive nature, etc. 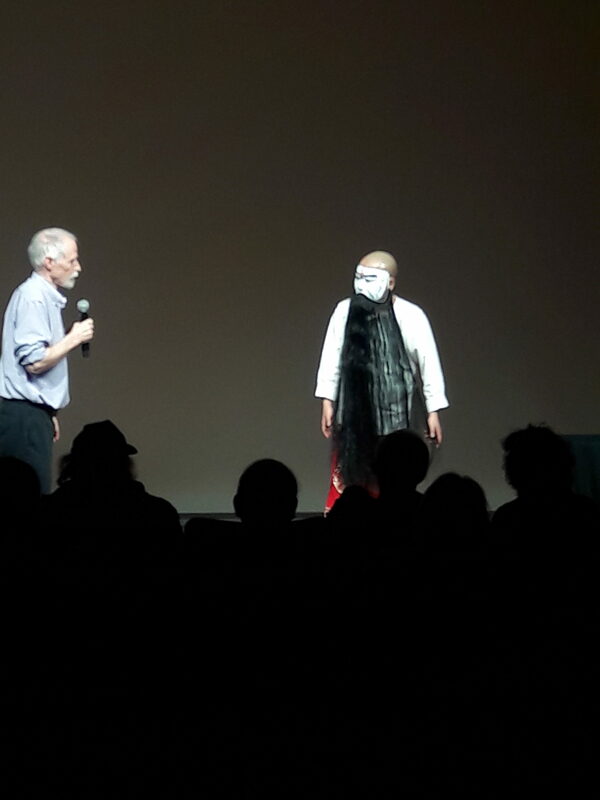 Li Yang performed two different songs for us, each song from a different character and therefore with different face paint. The first character was Cao Cao which is an evil character from the Romance of the Three Kingdoms, and the second character was Li Kui, from Water Margin, which is one of the four great classical Chinese novels. He performed each song twice, the first time without any face paint and the second time with the full face paint. 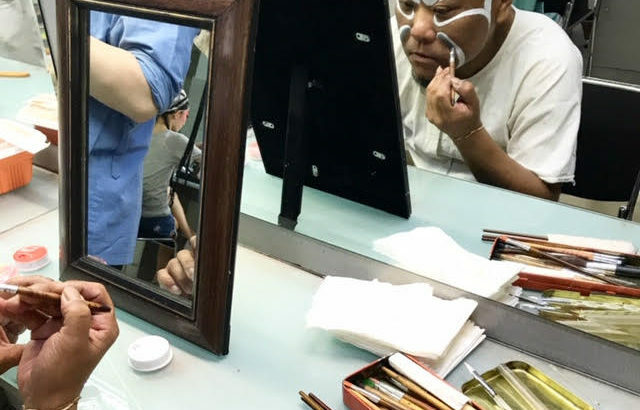 Li Yang paints his face himself. Actors in the U.S. don’t do their own makeup, but in Chinese Opera they do because this allows actors to create their own distinguishing features to their face paint. I actually enjoyed watching Li Yang perform the songs without any face paint more because I could see the expressions on his face more clearly. I thought his facial expressions were comical, especially when he would fully open his eyes and dart around his eyeballs. 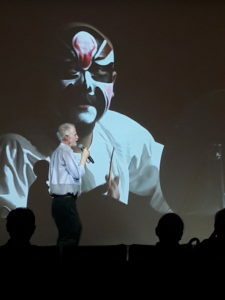 I really enjoyed watching his movements while he sang which reminded me of Tai-chi. The songs he performed for us usually have an orchestra accompaniment. Li Yang would mimic the sounds of the orchestra with his voice while he performed. It was very interesting to hear, the best way to describe it is with “tutt tutt tut, putt putt put” sounds. Afterwards, they had a raffle. I wanted to win the grand prize of getting my face painted by Li Yang, but instead, I got a bottle opener in the shape of a painted face. Which was still nice. I attached three images below, the first two images are of Cao Cao, the second image is Li Kui.